New Guinea is the primary home of the Bird of Paradise. Whether in the east in Papua New Guinea, or over in the west across the border in Indonesia's Papua provinces, references and imagery of the Bird of Paradise are found everywhere. Papua New Guinea’s national flag contains the bird, Air Niugini, PNG’s national airline bears the bird in it’s logo. Hotels, schools, products, restaurants, companies across the entire island use the bird as it’s symbol. And despite travelling extensively through New Guinea for 15 years now I have never once come across one of these elusive birds in their natural habitat. There’s a couple of reasons for this, one primarily being to see the Bird of Paradise in the wild you generally have to get up very very early in the morning, trek into the jungle away from populated areas, and be at a known “mating ritual” site by sun up, to see the males arrive and perform for the females. The males are the brightly coloured and decorated ones, as so often happens in the bird world. They use these features to impress the female and win her over for mating purposes. As well as the need to arise before dawn and trek into the jungle, I have never really been big on birds. “Twitchers” or what ever it is they call bird watchers and “Twitching” has never really been my thing. But when I was guaranteed a sighting of this magnificent bird during a visit to Indonesia’s West Papuan regency of Raja Ampat, I couldn’t really say no. 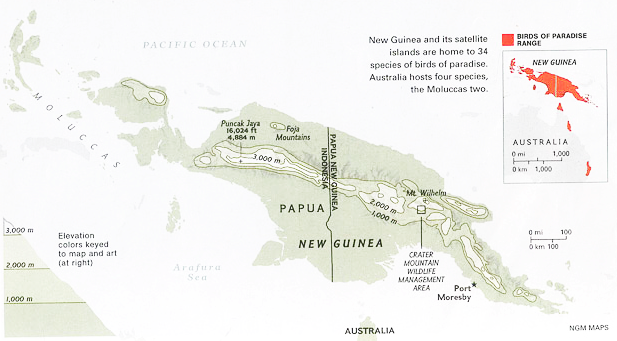 Ironically the entire island of New Guinea is said to resemble the shape of a Bird of Paradise. The area I was visiting sits off the area known as the “Birds Head” in the far west and looking at a map of the island one must admit there is a certain resemblance to the shape of a bird. I was staying in Kampung Yenwaupnor (Yenwaupnor Village) at the bottom of Pulau Gam (Gam Island) in a beautiful little guest house, run by a local Papuan lady Maria and her extended family. My bungalow sat out over the crystal clear blue water. Raja Ampat (Four Kings) is the name of the regency made up of four main islands and many smaller ones, numbering in total well over 1500. It encompasses more than 40,000 km² of land and sea, and also contains Cenderawasih Bay, the largest marine national park in Indonesia. It is a part of the newly named West Papua Province of Indonesia which was formerly Irian Jaya. The islands are the most northern pieces of land in the Australian continent. We set off before dawn on our trek to the bird’s known mating site, the site which pretty much guarantees a sighting, as much as anything in nature can be guaranteed. It was an uphill trek over rough bush tracks in the already high humidity, with my local village guide and an interpreter originally from Savu (see earlier blog post: Savu! Sabu! Sawu!) who was travelling with me for business. The local guide powered up the hill in the semi-darkness with ease and exhibited the skill of not making a sound with his feet on the ground as he walked, essential if hunting for your food and handy for sneaking up on Birds of Paradise. Not long into our trek the local guide commented how he was impressed that this large white man was keeping pace with him in the jungle and also managing to keep quite silent at the same time. It was too difficult to explain to him through the interpreter that I had spent many hours trekking through the jungles of New Guinea way to the east of here hunting for my own food just like he would do every day. He would no doubt be surprised if he was to learn this. It wasn’t long before we reached an area where we could here the calls of the Birds of Paradise as well as the sounds of many other birds calling to greet the sun as it slowly climbed into the sky. Homing in on the calls of the birds we were soon standing under a slight opening in the canopy high above where one could clearly see half a dozen or more males “performing” for two females casually perched observing the show. I haven’t quite worked out if I was looking at the Greater Bird of Paradise (Paradisaea apoda) or the Red Bird of Paradise (Paradisaea rubra), both of which are found around this area where I was. When first described by early explorers and further compounded by New Guinea locals who supplied specimens to early scientists to ship back to Europe for some reason with the legs removed, the original, and somewhat bizarre, western belief was that the Bird of Paradise had no legs and they where held for ever aloft by their exquisite plumage until their death. The exquisite plumage of these birds has long been used in the traditional dress of various different tribal groupings right across New Guinea and into the nearby Maluku islands, where two species of the bird are found. Several related species are also found on mainland Australia, such as the Riflebird for example. So finally after years spent wandering around New Guinea, without too much effort I had now seen the elusive Bird of Paradise, doing it’s thing, in it’s natural habitat. Raja Ampat has much more to offer than just the Bird of Paradise. The area sits in the heart of the coral triangle and provides incredible diversity in coral and other marine life. The people are super friendly with their own rich culture and the beauty of the region is postcard perfect. If you can find your way to Raja Ampat, the rewards will flow………….. Thanks for the info on Birds of Paradise on Gam. Will sail there there and see if we can arrange for an early morning trip. BBC has fantastic documentaries but nothing beats the real thing and sweat!